Show hidden files folders, system files and file name extensions in MS File Explorer on Windows 8.1 / 10 ! and check mark in the checkbox File name extensions and Hidden items ( ... see Image-1 Arrow-2). in "Folders Options" click or tap the Tab View ( ... see Image-1 Arrow-4) and check or uncheck mark in the checkbox to hide or show "extensions for known file types"
and hide or show the Hidden files and folders ( ... see Image-1 Arrow-5). (Image-1) See hidden files and folder and file name extensions in Windows 8. You can apply the view (such as Details or Icons) that you are using for this folder to all folders of this type. See also: ►►► ... Constant crashes after Windows 10 update, why? 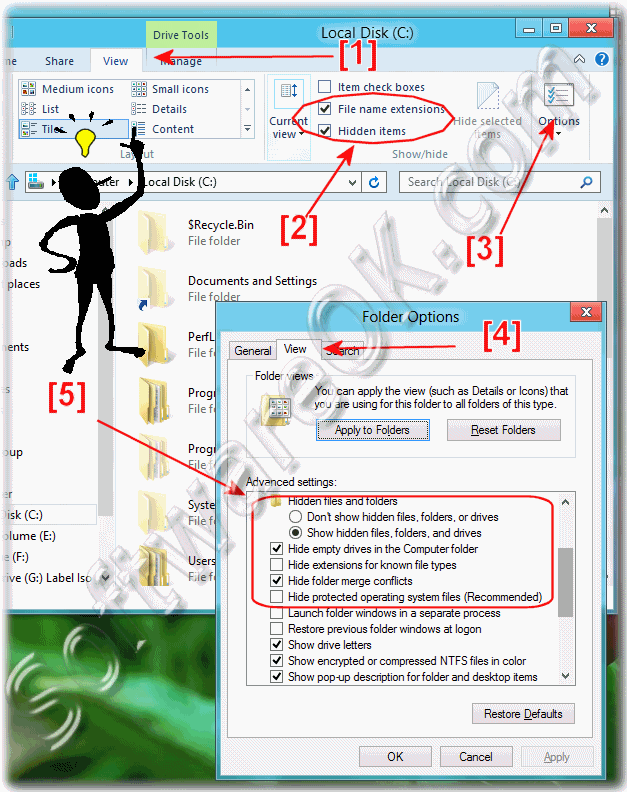 Windows-8 - FAQ-70: How to see hidden files and folder and file name extensions in Windows 8.1 / 10 Explorer? How to don't show hidden files, folders, or drives in Windows 8.1 Explorer? Windows 8.1 view hidden files? Sharepoint open with explorer hide hidden files and folders? Filename extension windows program windows 8.1 explorer? How to see hidden files in window 8.1? How to Hidden files and folders in Windows 8.1 Explorer? Hidden checkbox missing, window xplorer 8.1? Picture of hidden files remote extensions on computer? Hidden checkbox missing, window xplorer? How to hide empty drives in the Computer folder in Windows 8.1 Explorer? How to display file icon on thumbnails in Windows 8.1? How to launch folder windows in a separate process in Windows 8.1 Explorer? How to rest ore previous folder windows at logon in Windows 8.1 Explorer? How to display the full path in the title bar in Windows 8.1 Explorer? See hidden files and extensions in windows explorer? Windows 8 explorer see hidden folders, how to? Windows x8 explore 112 download hiding? How to display file size information in folder tips in Windows 8.1 Explorer? How to see file extensions windows 8? Programs folder in windows 8.1 file explorer? Windows 2012 server invisible file using all drive space? How to show hidden files using cmd pad? How to show status bar in Windows 8.1 Explorer? How to view the extension on file in windows 8.1? One drive file extensions missing window 8.1? How to hide folder merge conflicts in Windows 8.1 Explorer? How to show hidden files, folders, and drives in Windows 8.1 Explorer? 8.1 files folders and extensions? Windows 8.1 explorer hide software? Show hidden files in Windows 8.1 and name hidden software? What path is followed to display hidden file extension in windows 7? How to search all hidden files in windows 8.1 using search option, view full file name windows 8? How to hide extensions for known file types in Windows 8.1 Explorer? How to always show icons, never thumbnails in Windows 8.1? View hide icon option in windows 8.1? How to see .xml files on windows 8 windows explorer? How to see hidden folder? How to see in hidden files and file name extensions Windows 8! How to se Sharing Wizard when typing into list view in Windows 8.1 Explorer? How to show pop-up description for folder and desktop items in Windows 8.1 Explorer? Command to hide extension hidden folders? How to always show menus in Windows 8.1? Show encrypted folders in explorer? How to open advanced settings for Files and Folders in Windows 8.1? How to find hidden files in Windows 2008 desktop? See the filenames extensions in explorer windows 2012? 5. What is the program file name and extension of File Explorer? Shortcut for opening hidden files in windows 8.1pro? How to see Sharing Wizard when automatically type into the Search Box in Win 8.1? Picture of hidden extension remote on computer? Show encrypted or compressed NTFS files in color in Windows 8.1 Explorer? Windows 89 view hidden files? How to see in Windows 8.1 check boxes to select items in Windows Explorer? How to hide protected operating system files in Windows 8.1 Explorer? How to show drive letters in Windows 8.1 Explorer? How to show preview handlers in preview pane in Windows 8.1 Explorer? File hidden explorer, windows 8.1 explorer for file hide? Computer Management - show hidden files in 8.1? How to show hidden files and folders in windows server 2012?